Many teachers will be saying that as their school transitions to Chromebooks for students or refreshes old Chromebooks. The new education model Chromebooks have touchscreens and convert to tablet mode. The combination of touch and Chrome OS is probably here to stay awhile. Lenovo has released a Chromebook with a screen students can literally draw on with a pencil. There is even a just-released Chromebook tablet. David Andrade breaks down the reasons why schools may switch from iPads to Chromebook tablets for elementary students in his blog post, New tablets for Education – comparing the new Acer Chromebook Tab 10 and the new Apple iPad. 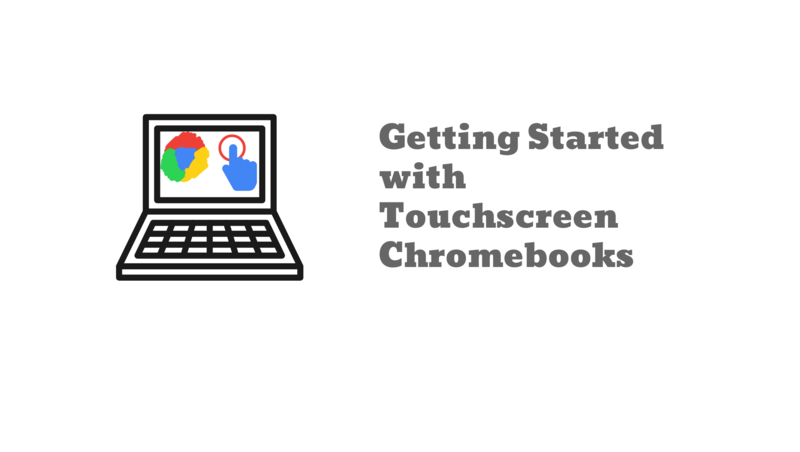 This guide is meant to help educators get started using these new Chromebooks that have both touchscreens and keyboards. Everything referenced in this post until the very end is web-based and immediately accessible upon signing in to a Chromebook. The very end of this guide suggests some tools that are great but will require district Google administrators to enable the Google Play Store. Before you do anything, even before reading this – beg, borrow, steal, cheat, lie, simply ask, or do whatever is necessary to get your hands on a new Chromebook the second it arrives in a district warehouse. Reading about apps and educational uses is great but nothing matches the experience of actually using the device. On to the guide. Let’s start with sketching, jotting, and drawing on touchscreen Chromebooks. Isn’t that straight up substitution? Classrooms should be places where students always feel free to quickly jot or draw something to help them process and make connections. Research suggests drawing is the most effective way to learn! Or just doodle for brain breaks. For more on the benefits of drawing for learning, please read A Simple Way to Better Remember Things: Draw a Picture from The New York Times (1/6/19). Annotating a website or PDF for a grade is rotten. However, getting messy annotating a website or adding content to a Google Jamboard Jam to process information, give feedback, or create a digital gallery walk is different. Use these tools to help kids get messy. Encourage it. An example of this is sketchnoting. Sketchnoting is so beneficial for kids and adults. Sketchnotes are often created on iPads that are more expensive than Chromebooks with a paid app (Procreate). Why shouldn’t kids sketchnote on Chromebooks for free? 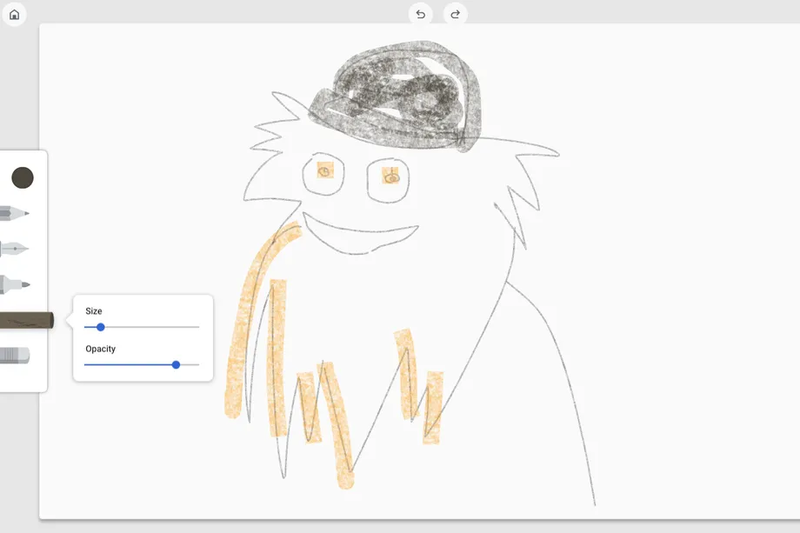 Google Keep and AutoDraw do not let students sketch or annotate on top of websites. Enter the Web Paint Google Chrome extension. The Web Paint Google Chrome extension is great for marking up websites. One drawback of Web Paint is it only works with what is on screen. There is no ability to scroll down the page. Robby Payne at Chrome Unboxed figured out that using Web Paint in conjunction with the FireShot extension allows for marking up an entire page and then saving it as a PDF. Google Jamboard is a drawing tool but its usefulness is elevated through collaboration. It is the perfect platform for student brainstorming. Google recently announced a streamlined web version of the great mobile Jamboard app. Watch as I demonstrate. Does your district need some help determining the right Chromebook for students? I can help! E-mail mistermullaney@gmail.com to inquire about my consulting services! Formative, found at goformative.com, allows students to draw in an assignment. The applications for this, especially in Math, are innumerable. In this simple example, I draw in a formative (Formative’s name for assignments) I created asking students to explain the Schlieffen Plan. In this example, I provided students with a map to draw on. Better yet, don’t provide the map! Students can insert images themselves. Or not. Let students determine how best they can depict a concept. I made a formative with two Schlieffen Plan questions – one with a map and one without. Feel free to make a copy for yourself. Incorrect, then correct. Help yourself to this French Revolution vocabulary Quizlet deck. This applies only to touchscreen Chromebooks that are convertible – meaning that can be used in stand, tent, and tablet form factors. Students can hand write in Google Docs, Slides, to enter a website URL, or basically anywhere they can input text. Please note this does not work if a mouse is connected to the device. Watch as I demonstrate. Bring Touchscreen Chromebooks to the Next Level – Android Apps! Email your district’s Google administrator to request enabling the Google Play Store in your district’s domain. Share with them this video by Allison Mollica which explains how admins enable Play Store access and this video by Thomas Rup and Eric Lawson which explains pushing Android apps to Chromebooks. Follow the linked Twitter handles in this post. These educators share great resources for integrating technology in the classroom. Some of them are not Chromebook superfans like me. Great! Better to have a broader perspective. Stay up-to-date about Chrome OS updates with the aforementioned Chrome Unboxed website. The site is constantly publishing valuable updates and tips-and-tricks. My Education Chromebook Reviews YouTube playlist includes videos that demonstrate the pluses and minuses of each model and show them in action. I will add to the playlist as reviews for new devices are published. I hope this guide is useful. To those of you already using touchscreen Chromebooks in the classroom, what did I miss? Please comment below or tweet me, @TomEMullaney. Thanks for reading. Does your school, organization, or conference need professional development to help teachers make the most of Chromebooks? Have a look at some of my offerings and connect with me on Twitter. Next How Does Curriculum Fit with Personalization, Technology, and Empowerment? And a Few More Questions.